Leading Edge of a Multicell Convective System (MCS). Sometimes thunderstorms will form in a line which can extend laterally for hundreds of miles. These “squall lines” can persist for many hours and produce damaging winds and hail. Updrafts, and therefore new cells, continually re-form at the leading edge of the system with rain and hail following behind. Individual thunderstorm updrafts and downdrafts along the line can become quite strong, resulting in episodes of large hail and strong outflow winds which move rapidly ahead of the system. While tornadoes occasionally form on the leading edge of squall lines, these storms primarily produce “straight-line” wind damage. This kind of wind damage is damage as a result of the shear force of the downdraft from a thunderstorm spreading horizontally as it reaches the earth’s surface. Long-lived strong squall lines are called “derechos” (Spanish for ‘straight’). Derechos can travel many hundreds of miles and can produce considerable widespread damage from wind and hail. Often along the leading edge of the squall line, is a low hanging arc of cloudiness called the shelf cloud. The shelf cloud appearance is a result of the rain cooled air spreading out from underneath the squall line which then acts as a mini cold front. The cooler dense air forces the warmer, less dense air, up. 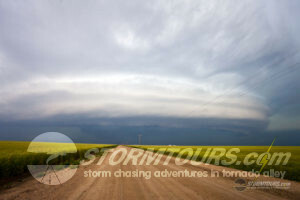 The rapidly rising air cools and condenses, creating the shelf cloud.